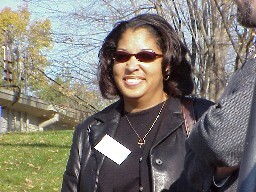 Each photo below may be viewed in a larger size by clicking on the photo. 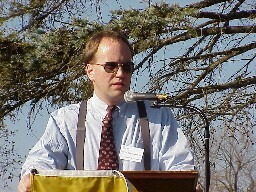 Dr. Philip E. Barnhart, NAAPO Coordinator, served as Master of Ceremonies (MC). The Flag of Earth is draped across the podium, but the wind quickly undid one side of the flag. Phil is the Volunteer Coordinator of the North American AstroPhysical Observatory, (NAAPO) which has overseen the operation and maintenance of the radio observatory since 1985. He is Emeritus Professor of Physics and Astronomy at Otterbein College in Westerville, Ohio. 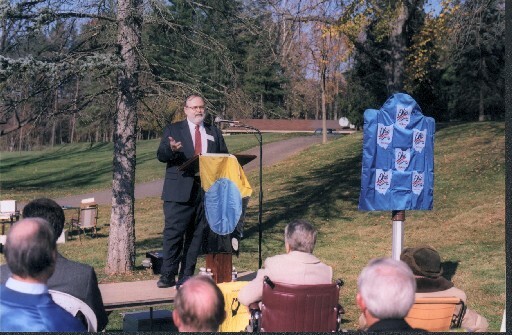 Phil Barnhart, later in the ceremony, talked about the 'Big Ear' radio telescope. He put on an 'appliance' (show-biz talk for something applied to a part of the actor's anatomy, in this case the face); Phil can be somewhat of a 'ham' from time to time (I assume this comes about because of him having been a Professor). This 'appliance' looks like a 'Big Ear' (this is easier to see if you click on the photo to see a larger-size version). Here you can see the Flag of Earth better (yellow sun, blue earth, and white moon on a black background). Two of our volunteers: Tom Hanson (on the left) and Ron Leeseberg (on the right) assist folks coming into the Dedication Ceremony, by giving directions for parking. 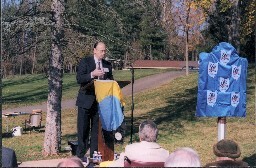 The Big Ear historical marker is located at the entrance to Dornoch Golf Club, and the dedication ceremony was held near the marker. 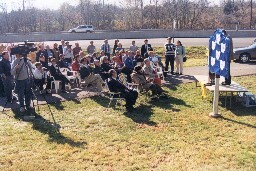 A good-sized crowd attended our Dedication Ceremony. There was local TV coverage. 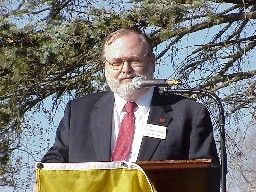 Dr. Robert S. (Bob) Dixon, Associate Director of the Ohio State University Radio Observatory (OSURO, also known as the Big Ear Radio Observatory), speaks to the audience. Bob Dixon was a student of Dr. Kraus and obtained his Ph.D. degree in Electrical Engineering under Dr. Kraus. 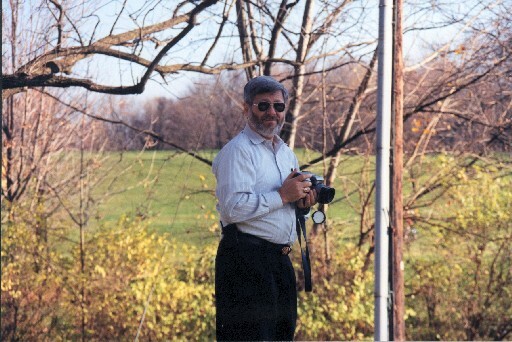 Bob created innovative observational aids, particularly in analyzing the data of the Ohio Sky Survey. Later, he conceived the ARGUS project. To Bob's left is the Big Ear marker with an Ohio Bicentennial Commission cover hiding the marker until near the end of the ceremony when the cover was removed. Bob Dixon is shown closeup (zoom lenses are a wonderful invention!). 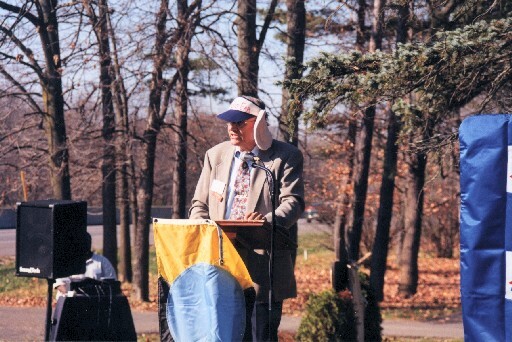 Dr. Jerry R. Ehman shares his reminiscenses of the Big Ear radio telescope and the accomplishments of Dr. John Kraus. Jerry Ehman, obtained his Ph.D. degree in astronomy from the University of Michigan where he specialized in radio astronomy. He was hired by John Kraus in 1967. At the Ohio State University he taught courses in the Department of Electrical Engineering half time and worked the other half time as a radio astronomer at the Big Ear Radio Observatory. 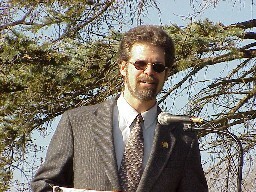 While at the Big Ear, he did some of the computer programming and was an observer during the Ohio Sky Survey. Later he continued on as a volunteer to program the computer and to analyze data from the Big Ear after the completion of the Ohio Survey. He was the first person to notice the amazing narrowband radio source, and he wrote the notation "Wow!" in the margin of the computer printout. "Wow!" is now a very famous expletive (but an expletive that can be voiced; there is no need for this expletive to be deleted). 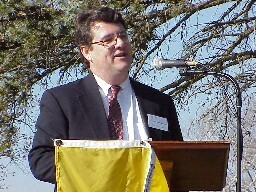 Dr. Jon Young, Director of OSU ElectroScience Laboratory (ESL). Jon used the Big Ear as a compact range for radar studies. While he was conducting those studies, our receivers needed to be turned off to prevent damage from the strong radar transmitter signals. Dr. Steven W. (Steve) Ellingson started as a volunteer at the Big Ear while in graduate school at OSU in Electrical Engineering. Currently he is the principal investigator for our Argus radio telescope project (Argus is considered the next generation of radio telescopes). Dr. Stephen (Steve) Brown served as a volunteer chief engineer at the Big Ear until obtaining his Ph.D. degree while working on the Argus program. 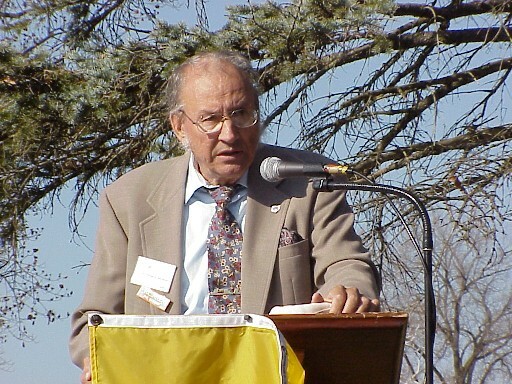 Both his Masters and Ph.D. degrees dealt with the theoretical and computational aspects of combining signals from individual elements (antennas) to form multiple beams in the sky (Bob Dixon's Argus concept). 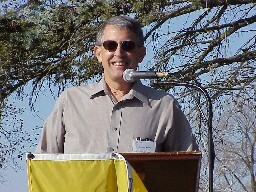 Russell (Russ) Childers was a volunteer who served as the chief observer at Big Ear for many years during the 1980s - 1990s. 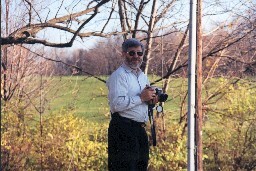 He created coomputer software to automate the observing program after the crash of the old standby computer. 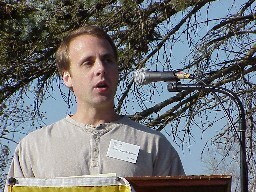 He created a program to recognize celestial sources and select narrow-band sources for closer scrutiny by the Big Ear. 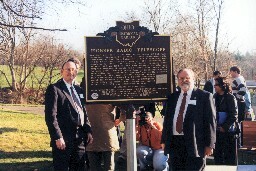 Mr. Philip Ross, Historical Markers Coordinator of the Ohio Historical Society (OHS), provided much advice and help in arranging for the production of this marker. 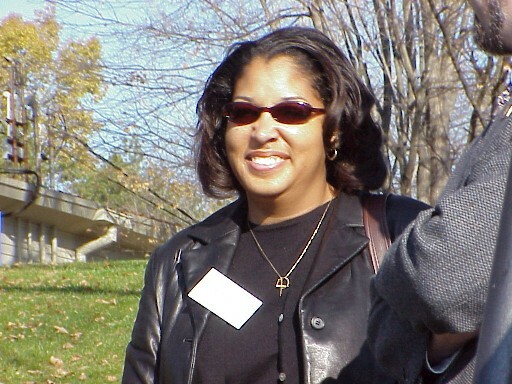 Ms. Carmelita Boyer, Regional Coordinator of the Ohio Bicentennial Commission (OBC), spoke about the OBC's participation in establishing this marker and the purpose of the OBC in general. 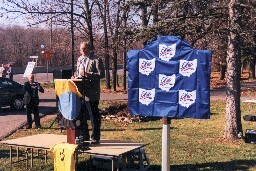 The blue cover of the Ohio Bicentennial Commission hides the marker, temporarily. What will the marker look like when it's unveiled? Ms. Carmelita Boyer, Regional Coordinator of the Ohio Bicentennial Commission (on the left) and Philip Ross, Historical Markers Coordinator of the Ohio Historical Society (on the right), unveil the Big Ear Historical Marker. 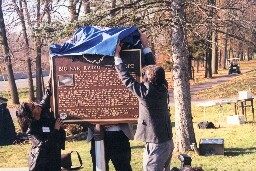 Phil Barnhart, behind the marker, is assisting in removing the cover. This shows Side 1 of the marker. Notice the number 1-21 in the lower right corner. That refers to the fact that this marker was the first OHS marker in Delaware County (county number 21 in an alphabetical list of counties in Ohio). The small photo embedded within the text shows the "Wow!" 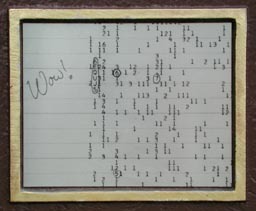 signal from the computer printout of August 15, 1977 revealing Dr. Jerry Ehman's notation of astonishment when he noticed the signal. Look below for a closeup photo of that portion of the marker. 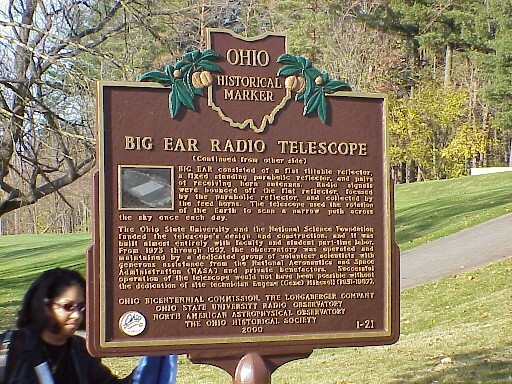 One half-mile east is the site of the former BIG EAR radio telescope. 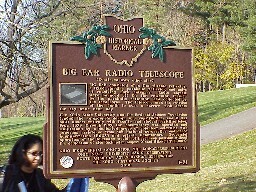 Designed by Dr. John D. Kraus, pioneering radio astronomer at Ohio State University, it had a collecting area of 340 by 70 feet (104 by 21 meters). The observatory was completed in 1963. 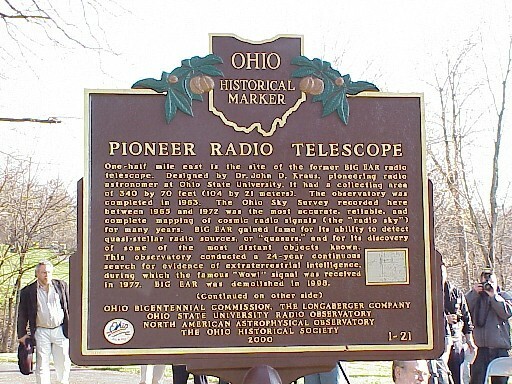 The Ohio Sky Survey recorded here between 1965 and 1972 was the most accurate, reliable and complete mapping of cosmic radio signals (the radio sky) for many years. Big Ear gained fame for its ability to detect quasi-stellar radio sources, or "quasars," and for its discovery of some of the most distant objects known. This observatory conducted a 24-year continuous search for evidence of extraterrestrial intelligence, during which the famous "Wow!" signal was received in 1977. BIG EAR was demolished in 1998. This shows Side 2 of the marker. 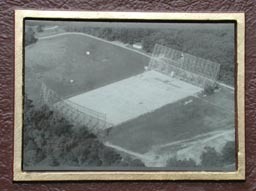 The small photo embedded within the text is an aerial photo of the Big Ear. Look below for a closeup photo of that portion of the marker. BIG EAR consisted of a flat tiltable reflector, a fixed standing parabolic reflector, and pairs of receiving horn antennas. Radio signals were bounced off the flat reflector, focused by the parabolic reflector, and collected by the feed horns. The telescope used the rotation of the Earth to scan a narrow path across the sky once each day. 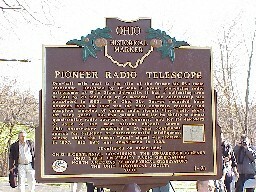 The Ohio State University and the National Science Foundation funded the telescope's design and construction, and it was built almost entirely with faculty and student part-time labor. 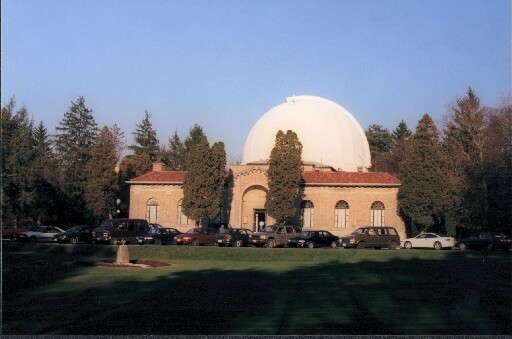 From 1973 through 1997, the observatory was operated and maintained by a dedicated group of volunteer scientists with generous assistance from the National Aeronautics and Space Administration (NASA) and private benefactors. Successful operation of the telescope would not have been possible without the dedication of site technician Eugene (Gene) Mikesell (1931 - 1987). 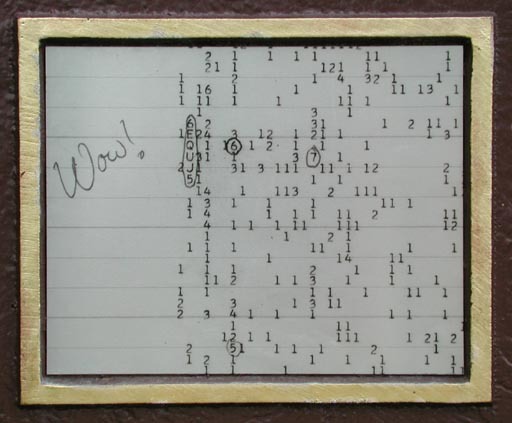 This is a graphic of a portion of the computer printout showing the famous 'Wow!' 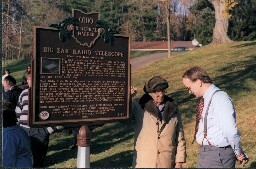 signal; it is reproduced on Side 1 of the Big Ear Historical Marker. Dr. Jerry Ehman discovered this very strong narrowband radio source and immediately wrote the notation 'Wow!' in the margin of the computer printout. This radio signal arrived on August 15, 1977. It was seen only once even though the radio astronomers at the Big Ear and others around the world have conducted many searches for the source of the signal. Even now, decades later, the source of this signal is still unknown. This is an aerial photograph of the Big Ear radio telescope; it is reproduced on Side 2 of the Big Ear Historical Marker. Dr. John D. Kraus, Director of the Ohio State University Radio Observatory, having built previous radio telescopes including an array of 96 helixes, designed and built this radio telescope; it was given the nickname of the 'Big Ear'. Construction was completed in 1963 and observations then began. Bob Dixon obtained his Ph.D. degree under John Kraus, and later became an Associate Director of the Radio Observatory. Dr. John D. Kraus, creator and builder of Big Ear, had indicated that he didn't plan to make remarks at this Dedication Ceremony. However, after he heard from all of the speakers and after the Big Ear Historical Marker was revealed, John was moved to make some comments to the assembled crowd. John Kraus is Ohio's first and foremost radio astronomer, designer and builder of the Big Ear, the third largest radio telescope in the United States. He is very well respected by those who worked with him at the Ohio State University Radio Observatory and by radio and optical astronomers world wide. Dr. John Kraus and Steve Brown are recalling the past after the unveiling of the marker. 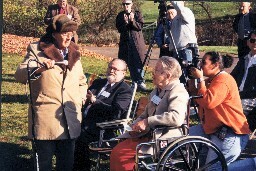 Dr. John Kraus and his wife Alice (in the wheelchair) are sharing memories with Bob Dixon. 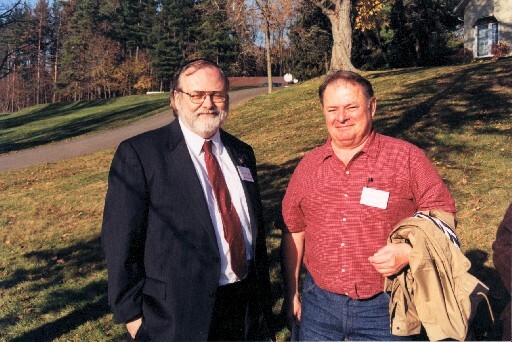 Jerry Ehman and Bob Dixon, long-time colleagues at the Big Ear Radio Observatory, enjoy the moment. James Cadle (on the right), designer of the Flag of Earth, talks with Bob Dixon. Dr. H. Paul Shuch, Executive Director of the SETI League, has been a good friend of our group. Paul flew his private airplane from New Jersey to attend the ceremony. 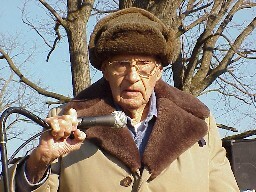 Afterward, at the reception at Perkins Observatory, he sang songs about Big Ear and the "Wow!" signal that he composed. 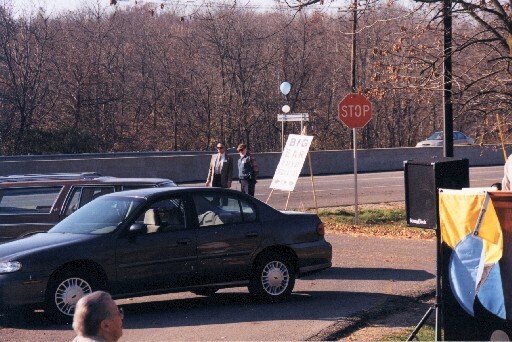 Following the Big Ear Historical Marker Dedication Ceremony, many in the crowd walked or drove their cars the short distance to Perkins Observatory where a reception was held (many thanks to Tom Burns, Director of Perkins and to his staff for opening the observatory for this reception). Paul Shuch, Executive Director of the SETI League, sang several of his own songs about Big Ear and the "Wow!" signal. 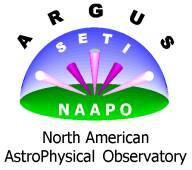 Copyright © 2002-2004 Ohio State University Radio Observatory and North American AstroPhysical Observatory.